Placement of stents may be an alternative non-invasive option to treat gastrojejunal (GJ) anastomotic leaks after Roux en Y gastric bypass (RYGB) surgery. The aim was to evaluate the performance of a covered metal stent (Alveolus 18 x 100 mm), across a GJ leak in a porcine model. Eight pigs weighing 20-25 Kg were used. In four pigs, a RYGB with a retrogastric GJ was performed and a 1 cm leak was created. In two pigs, no stents were placed and in two pigs one stent was placed across the GJ ananstamosis using endoscopy and fluoroscopy. In four pigs, a leak model with an anterogastric GJ was performed. In two pigs, one stent and in two pigs two overlapping covered metal stents were placed. The endpoints were position of the stents, healing of the leak and complications at necropsy. Stent placement was feasible in all pigs it was attempted. In the retrogastric GJ group, pigs without stent survived two weeks without complications and with healing of the leak. The two pigs with stents died on postoperative day (POD) 4 and 5. Kinking, obstruction and pressure necrosis of the Roux limb caused by the distal end of the stent were seen at necropsy. In the antegastric GJ group, one pig with one stent survived two weeks with healing of the leak but with stent migration into the Roux limb. The remaining three pigs died between POD 4 and 6. Pressure necrosis of the Roux limb caused by the distal end of the stent was found in all. In the pig with one stent, gross peritonitis caused by persistent GJ leakage was found. In pigs with two stents, jejuno-jejunostomy leakage was found in one and obstruction of the stent caused by kinking in the Roux limb in the other. 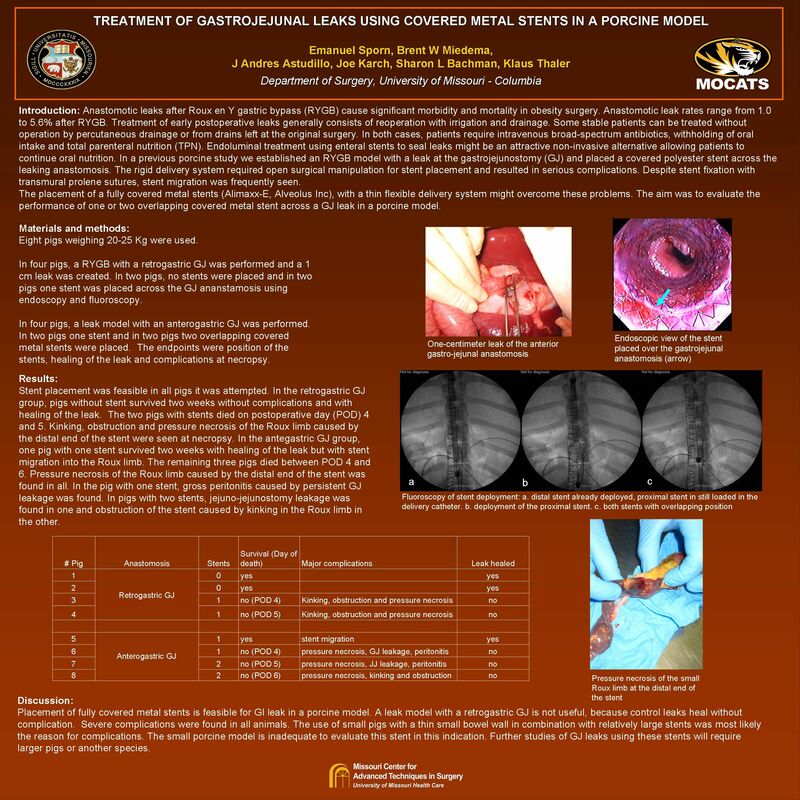 Placement of fully covered metal stents is feasible for GI leak in a porcine model. A leak model with a retrogastric GJ is not useful, because control leaks heal without complication. Severe complications were found in all animals. The use of small pigs with a thin small bowel wall in combination with relatively large stents was most likely the reason for complications. Further studies of GJ leaks using these stents will require larger pigs or another species.